11th of july 2014, finally came with the exciting news for those windows phone users who were begging for BBM to come on their windows phone devices. Since the original version is yet to be announced for windows phone but you can get the beta version for your windows phone and can experience it on your device. The hoping was started a six month earlier when the BlackBerry's CEO John Chen revealed on March 2013 that BBM will come soon on windows phones and claimed that it will come in month of May & June, but the first beta version announced on July. At that time, he also said, the messenger app will come pre-loaded on some nokia devices after it releases, also user will get it pre-installed on selected Lumia devices. BBM, which is stands for blackberry messenger is an instant messaging service actually developed for the blackberry platform. through this internet-based pin where people can get communicated with messaging and voice calls. But after getting popularity on blackberry devices, iOS and Android users also started begging for this and now they are using it after the release. Since the complete version is not yet released but its beta version is on the market to let users of windows phone use BBM and notify the company in case of any bug in it. Of course there are some bugs that someone may found. Few new features are included now in the beta versions too (Transparent live tile and more) and is going ahead to the completion. BBM for Windows Phone will be making use of the Windows Phone user interface focusing on three areas that are Contacts, Chats and Feeds. For the ease of access, a user can pin a contact to the start menu. 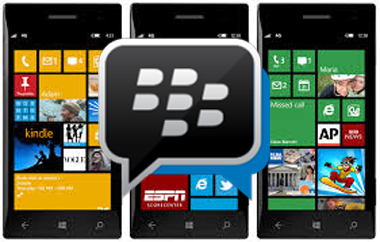 As in Android and iOS, BBM Windows phone users to chat with their one or more BBM contacts and can share pictures, voice notes, contacts and location. What BBM for Windows Phone Beta Lacks Of? The BBM beta for windows phone is lacking stickers, BBM Voice, BBM Channels and location sharing powered by Glympse. So you will miss it if you are a fond of these features which are available in BBM other than windows phone.